Firms in the UK used 1.8 million zero-hours contracts at the height of last summer, official statistics show. The total, in the first two weeks of August, was higher than the 1.4 million contracts revealed when figures were first collected in January last year. This is likely to be the result of a number of seasonal industries using more of these contracts, making a direct comparison difficult. Zero-hours contracts do not guarantee a minimum number of hours of employment. Some workers and unions are unhappy that staff can simply be sent home if there is no work to be done. But supporters of the contracts like the flexibility that they can offer. Additional data from the Office for National Statistics (ONS) showed that 697,000 workers said they were on a “zero-hours contract” in their main job between October to December last year. This represents 2.3% of all people in employment. This figure, collected in a survey, is reliant on these workers being fully aware that they are on a zero-hours contract. David Freeman, of the ONS, said that some of the greater awareness of zero-hours contracts was among people who had been in these types of jobs for more than a year. On average, someone on a zero-hours contract usually worked 25 hours a week, the ONS said. The majority were women and students, often aged under 25 or 65 and over. Facebook has been accused of breaking European data-protection laws, in a report written for Belgium’s privacy watchdog. The social network placed “too much burden” on users to navigate its complex settings, said the report. Also, it said, people were not told enough about how data Facebook gathered on them was used in adverts. In response, Facebook said it was confident its policies and terms complied with relevant laws. Facebook had a very complicated collection of settings which made it difficult for people to make an informed choice or be sure they were not surrendering data they wanted to keep private, said the report. Users should get more information about which information was being shared with and which organisations saw it, added the report. In response, Facebook said its updated terms and policies were much clearer and concise and helped “expand” the control people had over advertising. It said its privacy policies and terms were overseen by the Irish data protection commissioner, which made sure they both complied with broader European laws on how data was gathered and used for advertising. “We’re confident the updates comply with applicable laws,” it added. The report comes as European law makers are grappling with a significant update to the region’s data-protection regime. The updated laws are expected to be in force from 2017 onwards. A “starter kit” designed to spur on the invention of internet-connected gadgets has been announced as part of a tie-up between two leading tech firms. Chip designer ARM and cloud services giant IBM say it can take just five minutes to unbox the equipment and start sending readings to online apps. They suggest this will make it easier to test smart home, smart city and other “internet of things” prototypes. One expert said small start-ups would be among those that could benefit. These two components fit together and can be attached to the net via an ethernet cable and to other computer equipment via a USB link. This provides a way to take readings about the kit’s surrounding environment and the state of physical objects it is attached to. Instructions contained in the box guide the owner to visit an IBM website. If the owner enters the device’s credentials on this site they can see the data it is recording in real-time. In addition they can access a variety of tools created by IBM and other firms to analyse the information and/or funnel it through online programs that in turn control other internet-connected equipment. One example the firms gave for how this might be used in real-life involved using the kit to send information about local conditions to a remote data centre, which in turn would send back commands to a smart lighting system made up of internet-connected bulbs. Another more grisly suggestion was to connect a set of smart mousetraps to the internet, allowing a building janitor to know which ones had been triggered and avoid having to check each one in person. “Frankly the use cases are bounded only by human imagination,” said IBM’s vice president of development Rob Lamb. The boxed kit will be manufactured by another company, Freescale. The price has yet to be set, but ARM said it should be somewhere between $50 (£32) and $200. The components in the starter kit are not new, but by bundling them together ARM and IBM hope to tempt developers to their ecosystems rather than those of rivals. Nearly five billion internet-connected “things”, including fridges, sprinkler systems and cars – will be in use by the end of the year, and that figure is set to rise four-fold by 2020, according to the tech consultancy Gartner. 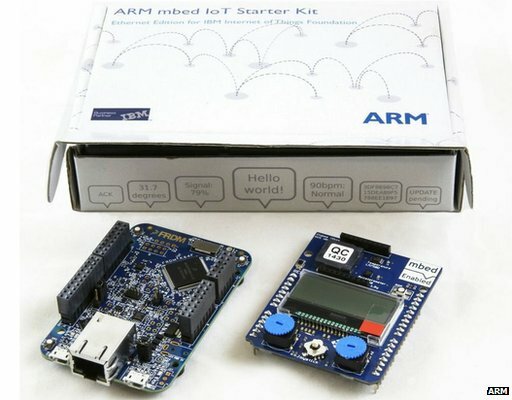 ARM makes money by both licensing its chip designs to computer manufacturers and charging firms using its forthcoming “internet of things” mbed operating system to securely transmit readings back to data centres. IBM provides a range of compatible cloud services, including the Bluemix platform, which allows online apps to be built and run, and Watson, an artificial intelligence-enhanced analytics system. Its goal is to entice developers who buy the kit with free trials of these products and then convince them to pay for their regular use and associated storage. ARM said the kit would be on sale within “months not quarters” but could not be more exact. The US has offered a $3m (£1.94m) reward for information on a Russian hacker, the highest the US authorities have ever offered in a cybercrime case. Evgeniy Bogachev was charged last year in the US with being behind a major cybercrime operation that allegedly stole more than $100m (£64.7m). He was last seen in Russia, where he is believed to remain at large. Arresting him may be difficult, as the US does not have an extradition treaty with Russia. Mr Bogachev, also known as “lucky12345” and “slavik”, is accused of running the GameOver Zeus attack network, thought to have infected more than one million computers. Victims were tricked into downloading malware, malicious software, which then searched specifically for financial information. Evgeniy Bogachev was charged last year on counts including conspiracy, wire, bank and computer fraud, and money laundering, after the FBI said it broke up the network. He is one of the FBI’s most wanted cyber-criminals. “This reward offer reaffirms the commitment of the US government to bring those who participate in organized crime to justice, whether they hide online or overseas,” the US State Department said. The reward is being offered for information leading to the arrest or conviction of Mr Bogachev. The head of the FBI’s cyber crime division, Joseph Demarest, said Russia’s internal security agency had expressed an interest in working with the US on cybercrimes, according to Reuters, but did not link it to the Bogachev case. He also said the agency was aware of 60 different cyber-threat groups linked to nation-states, but gave no further details. Ed Balls has come under fire for suggesting people should get a written receipt for all transactions, even small gardening jobs. The shadow chancellor said he always asked for a written record, even if it was just for £10 to cut a hedge, because it was the “right thing to do”. Work and Pensions Secretary Iain Duncan Smith said this was “absurd” and showed Labour did not understand business. He added he did not think anyone in the country would do such a thing. On Sunday Mr Balls told BBC Radio 5’s Pienaar’s Politics that people should ask for a record of paying somebody, even if it was for small jobs like cutting a hedge, because they have a “legal obligation” to pay tax. But Mr Duncan Smith told BBC Breakfast Mr Balls’s comments demonstrated “Labour’s complete lack of understanding of how business works and how people get by”. Cash payments are not dirty. In case you had gained the opposite impression, paying a self-employed person in cash for doing a job around your house or garden is completely legal. Furthermore there is no legal obligation on you to keep a record of the payment, or to account for it to anyone at all. It is your money and you can do what you like with it. All UK tax obligations lie with the self-employed person you are paying. As a matter of fact, a tradesman is not obliged to even offer you a receipt. But they should keep proper records so they can pay the right income tax and pay VAT too, if applicable. Of course, everyone knows that some tradesmen prefer cash because it is hard to trace. That makes it easier for them to dodge their own tax obligations, if they so choose. But so long as you have not colluded with them, there is no onus on you to do anything about it. You aren’t even obliged to grass them up, though HMRC would like you to do so. The shadow chancellor’s comments were made as Labour and the Tories continue to row over alleged tax dodging in light of the HSBC tax scandal. Mr Balls had been “extremely careful” about observing such rules ever since entering politics, he explained. In recent weeks, Mr Balls has been asked to answer accusations that the Labour Party is anti-business, but has insisted it has a track record of supporting an “open, dynamic, wealth-creating, entrepreneurial economy”. When an adult thinks about exercise, the first thing that comes to his/her mind is exhausting workouts in the gym on a treadmill or lifting weights. But for kids, exercise can have entirely different meanings, because playing games and being active is also exercise, helping the kids get fit. Kids exercise when attending gym classes, dancing classes or soccer practice at school. They also exercise when they’re at playing games, riding bikes, or having fun at the swimming pool. Today, most people follow such hectic lifestyle routines that no one has enough time to engage in regular healthy activities like gym sessions or sports. It’s also true that many parents don’t have enough time to properly encourage their children to take part in regular and organized sports and physical activities. Exercise and fun sessions also help to boost confidence and learning power of a child. Weight Control: It is often reported that many children spend their leisure time watching TV or playing computer games and do not involve themselves in children’s fitness, healthy fun and sports activities, resulting in many children suffering from some level of obesity. Increasing physical activity along with a well balanced & healthy diet has been known as an effective weight-loss strategy, and helps with self-esteem and socialization. Overweight children are exposed to many health hazards like hypertension, hyperlipidemia, type 2 diabetes, growth hormone dysregulation, and respiratory and orthopedic problems. Fun session and kids fitness activities help a child to improve their health and encourage a healthier lifestyle in general. Cardiovascular Protection: Although cardiovascular disease often doesn’t appear until adulthood, risk factors can be present much earlier in life. Regular exercise significantly reduces blood cholesterol level and thus, prevents from cardiovascular diseases. Mental Health Benefits: Fun sessions and kids fitness activities can also positively affect the mental health of a child. They can help reduce anxiety and depression, increase self-esteem, improve a child’s self-image, and help them cope with everyday situations better. Children’s fitness can be FUN and encourage a healthy life style. Kids R Fit provide children with a professional, supportive and friendly environment to take part in fitness activities, which benefit them socially, mentally and physically. For more information call us now on 0191 4387632 or visit the Kidz R FIt childrens health & fitness website today. Virgin Media has announced it is to invest £3bn in improving its fibre optic broadband network, increasing the network’s reach from 13 million to 17 million homes. It says it is the biggest investment in broadband infrastructure in the UK for more than a decade. Virgin said the investment would also create 6,000 new jobs of which 1,000 would be apprenticeships. Virgin Media currently has five million customers. The company is already in the process of expanding its network to 110,000 homes across east London, Glasgow, Sunderland and Teesside. Virgin Media said the additional £3bn in broadband investment would be worth £8bn in terms of stimulating UK economic activity. However, the money will be spent on filling in gaps in its existing network rather than widening the network to rural areas, which critics say has long been neglected by communications companies such as Virgin and BT. Speaking to the BBC, Virgin chief executive Tom Mockridge said it was BT’s job to do more to bridge the so-called “digital divide”. He told BBC Radio 4’s Today programme: “I think an investment of this size is unambiguously helping to close the digital divide. Everything can’t happen at once so we are really focusing on the areas where we can bring ultra fast broadband as quickly as possible and as effectively as possible.” He also called on BT to do more to invest in improving existing infrastructure to help speed up internet services in the countryside. The investment comes at Virgin Media announced a 2.3% increase in total revenues to £4.214bn for the year to the end of December compared with a year earlier. Virgin said the increase in revenue was largely the result of increased cable subscription revenue, which grew 3% last year. These days when you send your children off to college, you’re not just arming them with some ground rules and clothing for the semester. You’ve also got to pack them a laptop. New laptops are typically ready for wireless Internet access and allow students to work from anywhere on or off campus. Some classes even require laptops for note-taking, lab assignments and tests. As you set out to choose a laptop for your college kids, the options (and expense) can seem endless. Should you purchase a fully loaded PC or Mac? Or does your student only need an inexpensive netbook that will simply connect them to the Internet and allow them to send email and do basic word processing? You’ll also need to consider software selection, theft-prevention, online security and backup so they don’t lose those important term papers. Fortunately, there are some basic steps to follow in determining the type of laptop to buy — and how to ensure its, and your child’s, safety. Decide on a laptop. Most college students will get by with a PC laptop that includes software standards like a word-processing program for all those essays or a spreadsheet program for advanced math classes. If your child is studying graphic or Web design, however, they might need design software and a Mac, the platform that still tends to be favored by creative fields. A netbook might be suitable if they’re only writing papers and surfing the Web. Check the campus orientation materials for laptop and software recommendations. And if your child has already declared a major, you might also check with the department’s laptop requirements as well. Memory. How much do they need? Probably enough to store items often found on college laptops like MP3s or photos of friends. And depending on their major, they may need extra hard drive space for original creations such as large graphic design files, movies or digital music scores. Consider a laptop with 1GB to 2GB of memory depending on how they’ll use the laptop. Size: What’s more important: portability or screen size? Most kids will want a lightweight laptop so they can easily lug it along with the books. But some will prefer the larger 15-inch screen that can make the laptop heavier. DVD burner or multimedia features: Do they need these extras? For example, do they need a burner to make DVDs for assignments? Or do they need multimedia must-haves like a graphics card with extra memory or connectors, such as S-Video? Chances are this feature will come in handy for presentations they may have to give. Pick a security package. College students are among the biggest users of digital music, online gaming and freeware. Such activities involve a lot of downloading from the Internet, opening them up to security threats. Before they ever get online, make sure their brand-new laptop is loaded with antivirus, antispyware, and bot and phishing protection. Some programs will warn your kids of a dangerous download before they install and run it. Also look for a program that identifies files that can be trusted and those that cannot. Talk about passwords and physical security. To play it safe, urge your kids to protect their laptops by setting a login password they have to type before gaining access to any files. They should also change all their passwords often. Advise them to use passwords that don’t include real words or personal information, and that do include numbers and symbols in addition to letters. The other issue to consider is laptop theft. If they’ll be working in public spaces, they should get a laptop lock to secure their laptop to a table or desk before leaving it unattended even for a few minutes. In general, loaning out their laptop is not a good idea — their friends could download material that’s against their college network’s policy (like pirated music or software) or could leave it in an unlocked car or dorm, risking having it stolen. Create a backup plan. Thumb drives are handy, but they can’t store a semester’s worth of papers and a serious MP3 collection. If your college kid’s laptop does happen to be stolen — or experiences an unpredictable hard drive crash — having a backup will make the event less painful. With frequent, automated backups, all their assignments, emails and personal files, like photos, will be stored safely. Online services are now available that allow you to automatically back up your data to a secure storage site. This way, if your son or daughter loses their laptop, they can use a private login to access their data from any online computer. It’s true that picking out a laptop for your college-bound kid isn’t as simple as selecting dorm room décor. But with a smart buying strategy that includes security measures, you’ll be able to equip them with the tools they need to make it to graduation while protecting your investment along the way. US chipmaker Qualcomm will pay $975m (£640m) to Chinese authorities to end a 14 month anti-trust investigation into its patent licensing practices. The fine is the largest in China’s corporate history and will require the firm to lower royalty rates on patents used in China’s mobile phone market. The move could help Chinese smartphone makers Xiaomi and Huawei. Qualcomm said on Monday it would not contest the ruling that it violated China’s anti-monopoly law. “Although Qualcomm is disappointed with the results of the investigation, it is pleased that the NDRC (National Development and Reform Commission) has reviewed and approved the company’s rectification plan,” the tech giant said in a statement on Monday. The firm, which is the biggest supplier of chips used in smartphones, will now charge royalties based on 65% of the selling price of phones in China, instead of on the entire price. China’s expanding high-speed 4G network is driving demand in the world’s largest smartphone market, where Qualcomm as a key player. The chip giant made about half its global revenue of $26.5bn in China in its last fiscal year. News of the agreement sent the company’s New York listed shares up 2.8% in after-hours trading. The firm also increased its profit and revenue forecast for the current fiscal year. Chief executive Steve Mollenkopf said he was pleased the resolution had removed “uncertainty” surroundings its business in China. “We will now focus our full attention and resources on supporting our customers and partners in China and pursuing the many opportunities ahead,” he said. Samsung is warning customers about discussing personal information in front of their smart television set. The warning applies to TV viewers who control their Samsung Smart TV using its voice activation feature. Privacy campaigners said the technology smacked of the telescreens, in George Orwell’s 1984, which spied on citizens. Soon after, an activist for the EFF circulated the policy statement on Twitter comparing it to George Orwell’s description of the telescreens in his novel 1984 that listen to what people say in their homes. Samsung said: “If a consumer consents and uses the voice recognition feature, voice data is provided to a third party during a requested voice command search. At that time, the voice data is sent to a server, which searches for the requested content then returns the desired content to the TV.” It added that it did not retain voice data or sell the audio being captured. Smart-TV owners would always know if voice activation was turned on because a microphone icon would be visible on the screen, it said. The third party handling the translation from speech to text is a firm called Nuance, which specialises in voice recognition, Samsung has confirmed to the BBC. Samsung is not the first maker of a smart, net-connected TV to run into problems with the data the set collects. In late 2013, a UK IT consultant found his LG TV was gathering information about his viewing habits. Publicity about the issue led LG to create a software update which ensured data collection was turned off for those who did not want to share information.